The initial communication is set up using the “Add SPC Connect” button in the FlexC communications section. The complete set up is done in the one action. The correct URL for SPC Connect is entered automatically along with the correct port number and RCT ID. The installer has no setting to add for initial communications. 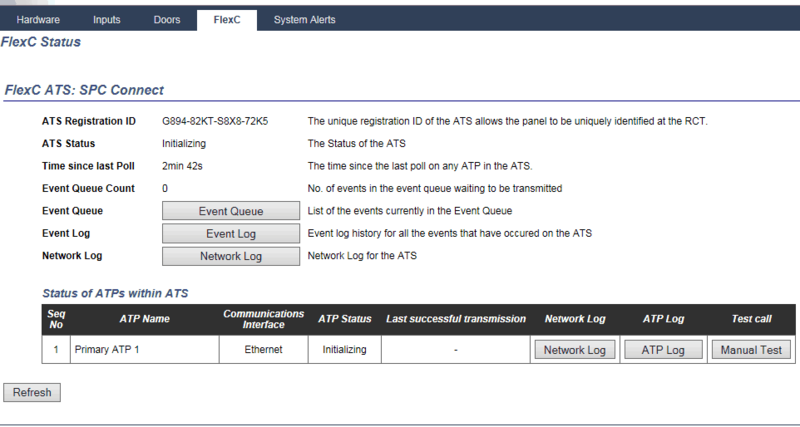 SPC Connect is added to ATP 1 and the registration Id is generated. This ID is critical as it’s the identifier for the communication to the SPC Connect portal. From the picture below you can see in the status column that it is now saying “Initializing”. The communication is waiting to connect to the portal and the encryption keys to negotiate. After this process which should only take no longer than 2 minutes, the status should change to OK. If it does not change to OK there are steps we can take to first find out what the reason for this is and secondly how to resolve it. Please note that the Ok status could change to Fault for any reason. The same fault finding processes will also apply in these cases. 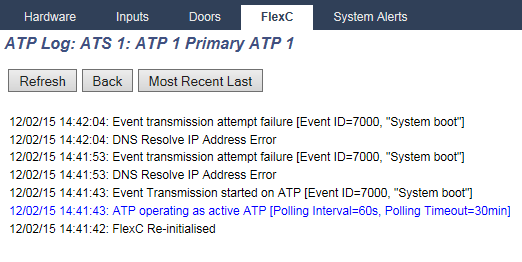 On the FlexC status for the connection, you see the system is at fault or initializing, this may be caused by a network connection issue. Ensure that the SPC panel is connected to a public network and that the network indication LEDs indicate activity. 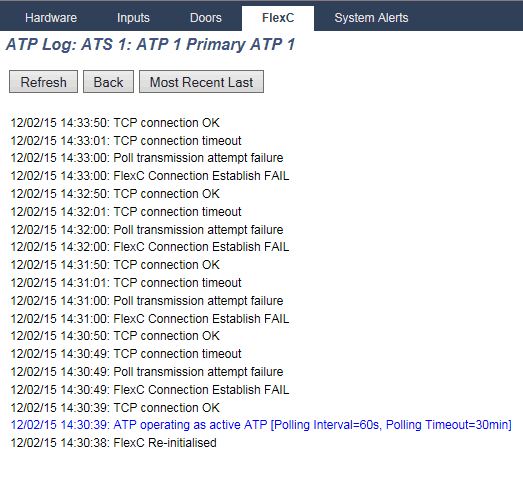 The first step is to view the APT log for the ATS connection. This can be found on the system status page under the FlexC tab. Click on the ATP log button on the bottom right. The SPC connect URL is added to the ATP by default and if there is no DNS or an incorrect DNS added in the SPC Ethernet setting then the connection to the SPC Connect server will fail. By checking the SPC Connect ATP log you will discover this type of issue right away. Please view the log below. An event “System Boot” is trying to be transmitted to the SPC Connect portal but is failing every time due to an incorrect DNS IP address. you will be required to create a telnet connection in order to test the DNS operation, you may not be able to resolve this issue without the support of the network operator, a full guide of how to perform this task can be found here. This error occurs when the SPC system is unable to communicate with the connect server, this may be down to a network security setting. if not, then the network may be blocking traffic on port 52000 outbound to the SPC Connect server (52.157.236.48). This will have to be resolved with your IT administrator. If the SPC system can connect to the server but not send data then the encryption keys may be out of sync, all other steps must be completed before completing this find step. 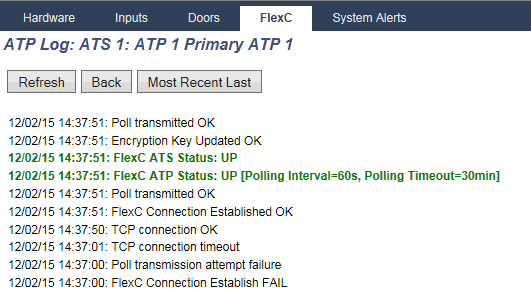 Access the SPC web page and select the FlexC configuration and the SPC connect ATS. 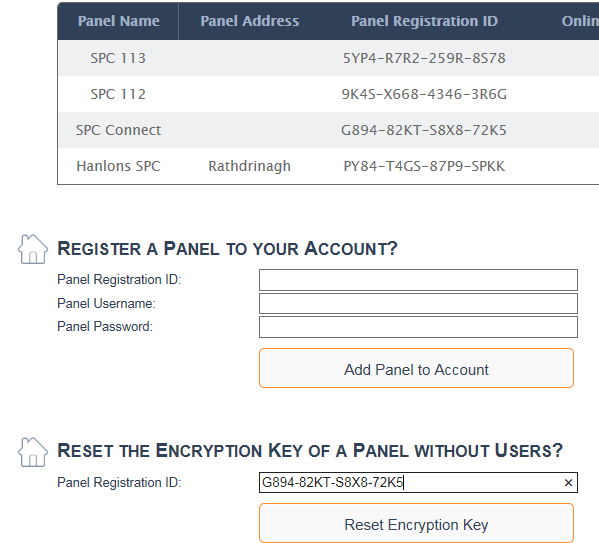 Each ATP has its own dedicated encryption key so make sure you select the correct ATP for the SPC Connect portal. 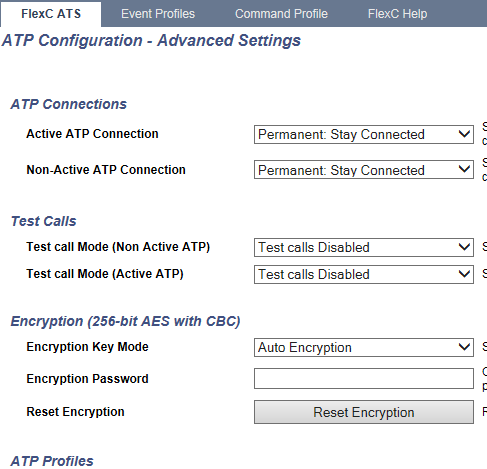 Go into advanced setting for the ATP and click on the Reset encryption button. Again if this does not work then the problem is the connection between the panel and the SPC Connect portal is broken. Check the cable link from the SPC controller to the switch and router. This can easily be dome by a simple ping command to the router gateway address. If you get a good reply then the connection is intact. If you do not, then check all physical links. If communications do not come online we will now reset the communications on the SPC connect server. To resolve the Encryption issue, check your account on the SPC Connect server and verify that the registration ID is available. Put the Registration ID into the box shown below and click on the “Reset Encryption Key” button. If you cannot see the Registration key in your account try the same process. Enter the registration ID exactly on the ATS for SPC connect. If this process does fix the issue then you should see the ATP log highlight the fact. You will receive a Poll transmitted OK and the ATP account code will change from 0 to an eight-digit account code. 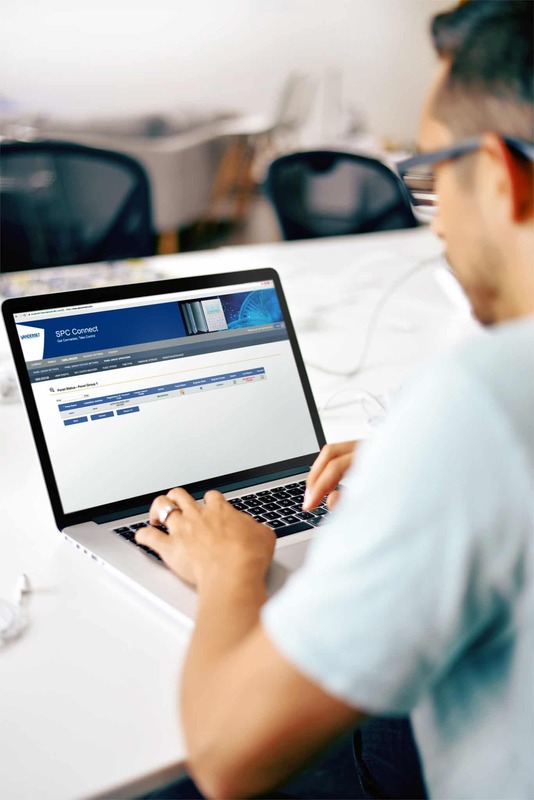 SPC Connect uses the latest and best online security methods available. Please checkout our SPC Connect Security document.